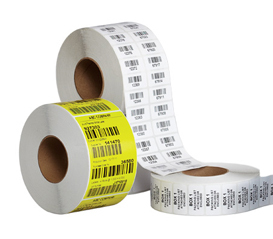 Thermal transfer labels are the perfect solution for companies printing large volumes of shipping and barcoding labels. These labels are more durable than the direct thermal alternative as they require a ribbon to print. Consequently, they are less likely to scratch, scuff, or fade. If you need the print on your labels to last more than 6 months, thermal transfer labels are the perfect solution. 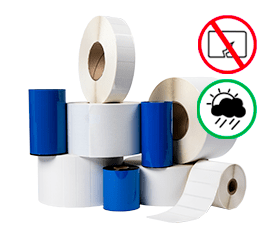 Why Use Thermal Transfer Labels? 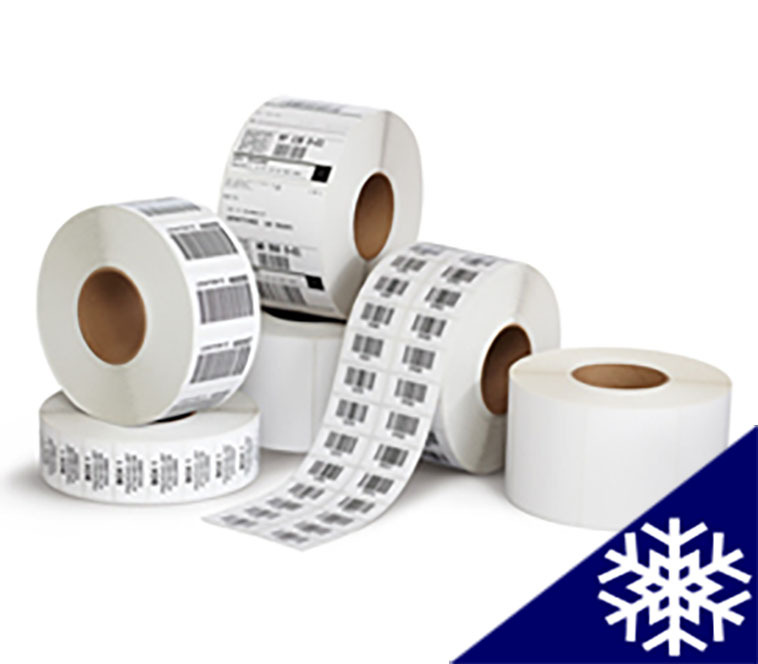 Thermal transfer labels offer world-class barcode printing for most applications. In thermal transfer printing, a hot print head melts a wax ribbon onto the blank printing label. The result is a rugged, permanent print that can take a beating. The wax ribbons print a strong, high-contrast black. Without this ribbon, you cannot print on thermal transfer labels. Thermal transfer printing is highly cost-effective. The materials are cheap, and the printer itself is a fairly simple machine. Thermal transfer printing produces images with extremely tight tolerances. That results in instant barcode reads and very few errors. 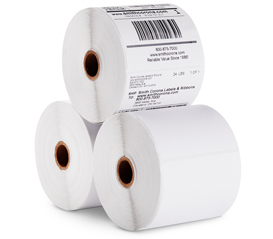 We have a wide variety of roll and fanfold style thermal transfer labels to choose from. If you are searching based on material, we offer both paper and polypropylene labels. If you are looking for a color other than white, we also stock over a dozen different colors. 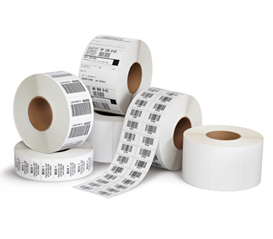 Additionally, for those companies with print & apply label applicators, we have non-perforated labels available for sale. These non-perforated labels are available in standard size rolls and jumbo (12” outside diameter) rolls. On top of the wide variety of thermal transfer labels available, we also have different types of adhesive for our customers to choose from. Not every application is the same. Because of that, we offer all-temperature, removable, and freezer grade adhesives. By far our most popular product is the 4x6 label. We offer that product in almost any color, adhesive, material and format possible. 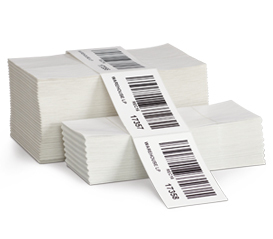 Most companies use thermal transfer labels on industrial sized (3” core) printers as these printers are engineered to print barcodes at high speeds in large volumes. 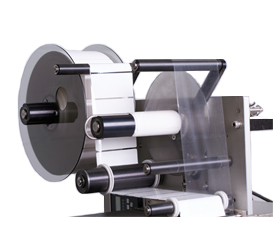 These printers are quite versatile, as they can use both roll labels and fanfold style labels. Although it is rare, some companies do use desktop (1” core) sized printers to print thermal transfer labels. The most popular thermal transfer printers are made by Zebra. However, many companies utilize Datamax, Sato, Printronix, Intermec, Monarch, TEC, Honeywell, and some others. 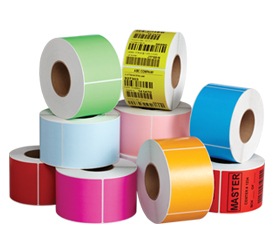 It is important to know what brand of printer you use when choosing which ribbons to buy with your labels. Contact our customer support team if you need help choosing the right label/ribbon combination. At Smith Corona, we practice efficient supply chain management and take advantage of economies of scale. That allows us to offer you the highest-quality thermal transfer labels on the market—at unbelievably low prices. If you aren't sure which thermal transfer label is right for your machine, give us a call at 800-875-7000 or email us for assistance. Our trained customer service staff will help you determine which products you need.